The following example project the want to show in this post talks about an example of Pid Control with Android. 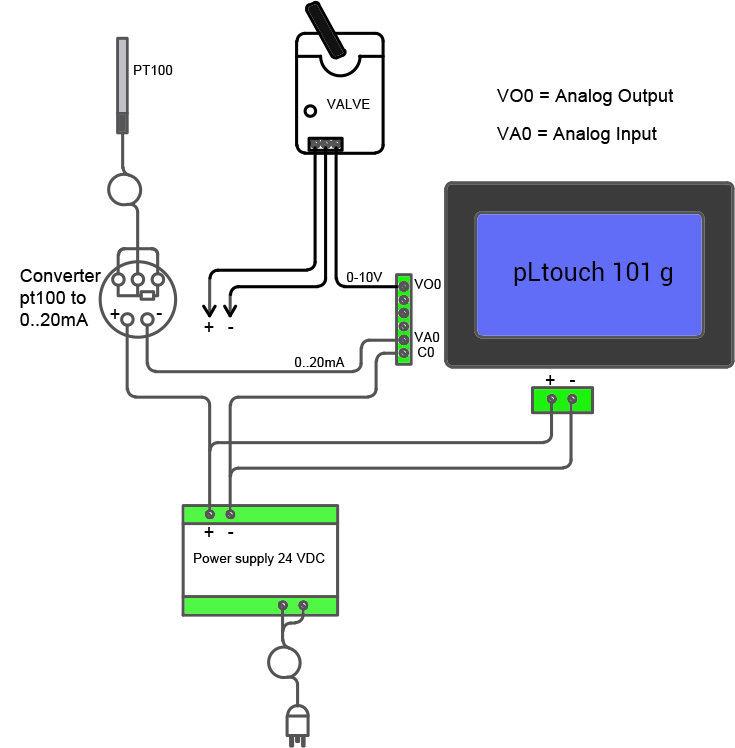 Particullary will be explained how to use the PID function for controlling heat using pLtouch 101g . In this case the PID mode the we are going to use is for heating and we will use function PID1; so that when heat drops it will encrease ServoControl based on a Set Point Updatable from the touch Screen. For acquirng the heat, we use a normal probe mod. PT100. Because pLtouch 101g has 4 power inputs, we use a converter capable of converting the heat in a signal of current with a range between 0 … 20 mA. 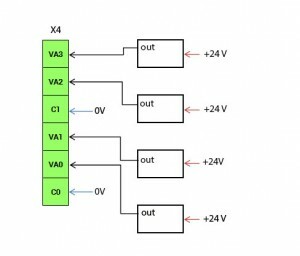 We link the converter Output at the first analog inpu of pltouch 101g, with its own clamp VA0 ( maggiori dettagli ). The Pid function will Lead the exit, in this case, a modular ServoControl with input 0…10 V so we link the first Output in tension of pLtouch 101g, at the Actuator like from scheme. In case you have Actuator or ServoControls with comand in current linked like from the description of our wiki page. Feed pLtocuch 101g at 24Vdc with removable camps on the back of the case. That made, we open Eclipse IDE. I deliberatly choosen to not focalize interface Design aspect, but on the most tecnical aspects of the project. Can be you, reader, that you can with your fantasy the best interface responding to your needs. This parameters can be instantied at App startup or you can call it in any moment. In our case we have a button that calls the function from Library. We read analog input 1 putting it on the variable z so that we can convert it in heat and show at video. LIke you see, simply call the Library pManager.analogRead And assign reference to Analog Input. Now we can activate the PID function and we obtain the modulation for the ServoControl based on heat. We use a simple switch, so that at changin stat it has value from 0 to 1.
where the first field is the relative function ( like in our function example 1) and the second to the start / stop of the same function.